I'm done, for now at least. Walls is joining my quilting pile. So now a couple of days, at least, trying to make headway with my current handquilting project. I don't know what I'm going to do next with my piecing. I might carry on with wall-based stuff: there were several points when this could have gone different directions and maybe there's something interesting there. Alternatively I might do something completely different. Not sure yet; right now I'm just happy this one is done. Linking up as usual with Patchwork Times for Design Wall Monday. It's turning out spectacular. Been loving, watching you create this quilt. How and what design are you going to use? It's beautiful, Kaja! I really like how you put it together, and it's always great to see your process along the way. Looking good, great movement and interest. Such a great top! The movement of the dark blue across the surface works effectively to keep the eye moving. The strings of little squares add interest. Kaja, it's been so much fun watching this top grow. I will miss seeing it, but I know that whatever you do next will pique my interest. How sweet that Lara had what you needed when you needed it and was willing to share (and supplement!). It was meant to be. That turned out really well - I too really enjoyed following along with your process and progress! When I look at quilts with so many sizes of blocks, like this one, I always wonder how the quilter put the pieces together. I have to study for a while until I finally see the lines. It's a fun quilt! Kaja this turned out brilliant! It has been so fun watching you work, as always. I'm impressed with how well you fit all those differently sized blocks together. It is an interesting blend of exciting movement and stillness. I don't know if that makes any sense to you, so will try to explain: My eyes travel all around the quilt looking at one thing and then the next. Then, at the same time, there is also a peaceful balance to it the whole design. Great work! It came together very nicely . 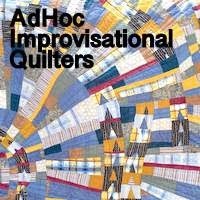 There are a lot of really interesting tidbits to discover in this quilt. Love the flow of colors in this one. Beautifully done. Looks great, Kaja!! It is incredible how you pieced all the different sized blocks together. This is totally my kind of improv. I adore everything about this! !